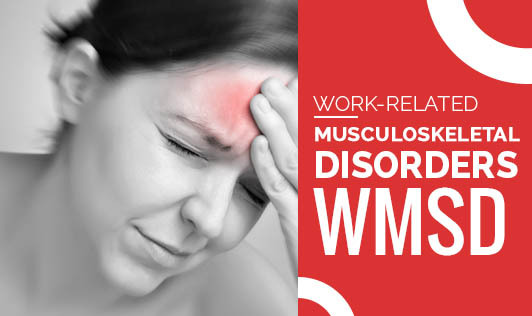 Musculoskeletal disorders (MSD) develop as a result of gradual and constant exposure at workplace to physical risk factors caused by poor ergonomics, are termed as Work-Related Musculoskeletal Disorders (WMSD). They include a wide range of injuries to the muscles, tendons, nerves, and ligaments and may affect the neck, back, shoulder, wrists and fingers. WMSD develops over time, if frequent pain is ignored. The most common disorders that develop as a result of poor workplace ergonomics include Tendinitis (inflammation and pain in joints such as wrist, elbow, and knee), carpal tunnel syndrome (pain, numbness, tingling in the hands), slipped disc, sciatica (pain running along the large sciatica nerve from the lower back to the back of each leg), tension neck syndrome (stiffness and fatigue in the neck) and lower back pain. If ignored for a long time, musculoskeletal disorders can lead to permanent and irreversible disabling conditions. Be proactive, and see a physician immediately if you have been experiencing the following symptoms: · Burning, aching, throbbing or shooting pain in joints and muscles · Mild muscle aches · Muscle tightness or swelling · Reduced range of motion · Tingling sensation or numbness due to pressure · A feeling of heaviness in the arms or legs · Loss of grip or loss of muscle strength · Pain while performing specific daily activities · Cold hands Musculoskeletal disorders develop gradually. So, the longer you wait, the more intense and irreversible MSD gets.